High Wycombe, UK, 27 June 2017 International POS printer manufacturer Star Micronics has joined forces with leading POS software provider Nobly POS to provide an mPOS solution that is ideal for coffee shops and mobile food and drink businesses. 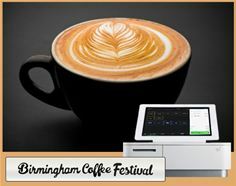 The complete mPOS solution will be demonstrated by Nobly POS at the Birmingham Coffee Festival (1-2 July 2017, The Custard Factory, Digbeth, Birmingham). The event brings together a number of independent coffee shops and coffee culture experiences. Visitors to the festival will be able to sample a range of speciality coffee as well as food from around the world. The mPOS solution incorporates Star’s combined Bluetooth printer and cash drawer solution mPOP™ with an iPad based easy-to-use point of sale system from Nobly POS. The stylish mPOP from Star is ideal for coffee shops and mobile businesses given that it is low cost, lightweight and space-saving at just 10cm high and 30cm wide. As a result, the unit can be securely stored or transported at the end of trading. With front feed receipting, mPOP can easily be placed under the counter for enhanced space-saving. With the POPPack option that includes a high quality black or white tablet stand (alternative colours are available if required) and metal plate, users can successfully create a stylish mPOS station. The POPPack design provides a flexible option with the extra security required within a retail environment, whilst retaining the mobile element. “We are pleased to be working with Nobly POS to provide a cost-effective and flexible mPOS solution that precisely meets the needs of independent businesses across the hospitality sector”, adds Annette Tarlton, Marketing Director, Star Micronics EMEA. Founded in 2013, Nobly POS is the #1 rated cloud EPOS system for a modern hospitality operator. The Nobly system is cloud-based which gives merchants the power to change product features in 100 stores at the press of the button. All key data syncs instantly and updates are carried out with ease. Nobly acts as your store’s Back Office and can help you run nearly every aspect of your enterprise by handling all the time consuming tasks like inventory management and data analytics quickly and reliably, allowing you to concentrate on the day to day running of your business. Nobly POS is currently used by hundreds of happy store owners in over 40 countries. Headquartered in London, Nobly also has offices in the United States via a New York City office and has a development centre boasting top engineers in Montevideo, Uruguay. Copyright © 2011 – 2017 Realwire Limited, all rights reserved.